The Broadcasting Board of Governors (BBG) has put all the eggs of broadcasts to Russia from the U.S. in one basket. FreeMediaOnline.org, Free Media Online Blog, GovoritAmerika.us, Commentary by Ted Lipien, July 10, 2009, San Francisco — Established in 1942 in response to wartime emergency, the Voice of America (VOA) has been the official U.S. broadcaster, funded by American taxpayers and guaranteed journalistic independence by the U.S. Congress. VOA journalists produce radio and TV programs and maintain Internet websites in multiple languages. VOA helped the United States win the Cold War and continues to provide uncensored news to countries with limited or no free media. But when President Obama went to Moscow this week and met with President Medvedev, Prime Minister Putin, as well as with opposition and civil society leaders, a VOA Russian Service correspondent who was reporting on these meetings vainly tried to see his own work on the VOA website. The VOA site suffered a catastrophic failure and was out of commission for at least two full days due to a suspected North Korean cyber attack. The Russians could not learn from the Voice of America about President Obama’s speeches in which he talked about human rights and media freedom issues in Russia. These speeches were not carried live by the Kremlin-controled national TV and radio networks and did not receive wide coverage from independent media outlets, few of which still remain. Other U.S. government websites were also targeted by the latest cyber attack, but only the Voice of America website was made inaccessible for a number of days. This failure is extremely disturbing, since the Voice of America, created during World War II with a mission to provide accurate and objective news to the rest of the world, is still considered by the U.S. Congress and the White House as an important national security asset, especially in times of national and international emergencies. Until the summer of 2008, the Voice of America Russian Service still had on-air radio and TV programs. Some of the radio programs were transmitted on short-wave, which hostile governments cannot easily block, while other radio and TV programs were rebroadcast by local stations and networks in Russia, even as the Russian security services were trying to force them to stop from carrying such foreign broadcasts. This is when the Broadcasting Board of Governors (BBG) — the bipartisan body which manages U.S. international broadcasting entities, including the Voice of America, Radio Free Europe/Radio Liberty, Radio and TV Marti, Alhurra Television and others — decided that from now on the Voice of America will only use the Internet for delivering its programs to Russia. In July 2008, the BBG took all VOA Russian-language radio programs off the air. 12 days later, the Russian army attacked the Republic of Georgia over a territorial dispute, creating a major crisis in Moscow’s relations with Washington and other Western nations. Despite of the political and news emergency resulting from the Russian military attack, the BBG refused to resume VOA radio broadcasts to the war zone. 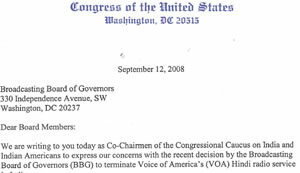 Before the Russian-Georgian war, members of Congress and representatives of human rights and media freedom organizations had warned the Bush Administration that the BBG’s Internet-only strategy for the Voice of America in Russia represented a serious national security risk and a further threat to what little remained of the Russian independent media. The BBG ignored these warnings. The BBG not only did not anticipate the possibility of a Russian attack on Georgia, BBG members also did not consider the possibility that Barack Obama would be elected president, or that in the resulting improvement in U.S.-Russian relations, VOA might again be able to expand placement of its programs on national and local media in Russia. Such program placement represents the best option for gaining a large audience, assuming that it does not compromise journalistic freedom and objectivity of the programs being produced for local rebroadcasts — something that the BBG’s “marrying the mission to the market” strategy was not able to guarantee. In fact, it encouraged biased, unbalanced and soft journalism, as in Alhurra TV network’s coverage of the Holocaust deniers conference in Tehran, hosted by Iranian President Mahmoud Ahmadinejad, and in some of Radio Free Europe/Radio Liberty’s (RFE/RL) programs. Both Alhurra and RFE/RL are managed by the BBG. While the Russian government continued to expand placement in the United States for its international TV program, “Russia Today,” the BBG granted victory to the Russian security services in their intimidation campaign designed to drive the Voice of America off the airways in Russia shortly before President Obama was elected and promised to work to improve U.S.-Russian relations. If they are serious about U.S. international broadcasting, the Obama Administration officials should now point out to their counterparts in Moscow that, unlike harsh treatment of foreign and local media in Russia by the Russian secret police, the FBI and the CIA have not been trying to force “Russia Today” off American stations and cable channels. Had it been allowed to maintain its multimedia program delivery strategy, the Voice of America could now be in a good position to quickly regain its TV and radio audience in Russia. But BBG officials killed both radio and TV, ignoring their own audience research, which showed that VOA was only reaching about 0.2% of the Russian audience through the Internet. Most importantly, however, they ignored clear evidence that, unlike radio and satellite TV, the Internet can be easily sabotaged and blocked not only by the Russian FSB, the KGB’s successor, but even by security services of other countries, and possibly also by ordinary hackers. The BBG has put all the eggs of broadcasts to Russia from the U.S. in one basket. BBG officials failed to anticipate what might happen to the Internet-only strategy if U.S.-Russian relations should take a sudden turn for the worse. If the North Koreans could launch a successful attack on the VOA website — assuming that North Korea was indeed behind the latest attack — so can the Russian security services if ordered by the Kremlin. They demonstrated this ability during the Russian-Georgian war by blocking the Georgian government websites. Another BBG-managed broadcaster, Radio Free Europe/Radio Liberty, still has radio programs to Russia. But RFE/RL staff is based in Prague, the Czech Republic, and in Moscow. Its broadcasts do not focus on the United States or provide an American perspective on world events. In any case, RFE/RL reporters working in Russia are vulnerable to intimidation by the Russian security services. These foreign-born, locally-based journalists are discriminated against andÂ denied basic legal protections by the BBG. They would be especially threatened if a serious crisis developed in U.S.-Russian relations. Americans should not be surprised, however, by the BBG’s dismal record. The Broadcasting Board of Governors has been consistently rated by the U.S. Office of Personnel Management as the worst managed Federal agency. There have been many calls for abolishing the current board in charge of U.S. international broadcasting. Some have suggested taking away the BBG’s powers to conduct day-to-day journalistic and programming operations. Others have called for selecting competent journalists, human rights, and media freedom professionals to fill the vacant BBG positions. Journalists working at the Voice of America Russian Service hope that something will be done to make their programs once again heard and seen in Russia. As a result of the BBG’s termination of on-air radio and TV Russian broadcasts, their audience in Russia shrunk by an estimated 98%, an unprecedented audience loss in the history of international broadcasting. The same BBG officials who suggested that the Internet-only strategy for VOA in Russia would work also failed to protect the VOA website from a relatively minor cyber attack. Some VOA Russian Service journalists, frustrated by the inability of the BBG and VOA management to grasp the opportunities presented by President Obama’s call for a “reset” in U.S.-Russian relations, have started to explore with Russian networks the possibility of launching live TV discussion programs between Washington and Moscow, which would be conducted outside of VOA, privately funded, and would focus on serious political, social, economic, and cultural topics of the day. BBG and VOA officials eliminated such programs last summer and ordered production of short videos with a focus on popular American culture. The morale of journalists working for VOA’s Russian Service is at all time low. One of its most experienced journalists and managers has left. VOA executives refused to fill the position of the service director, appointing instead a number of non-Russian managers, some of whom do not even speak Russian. They also refused to send a Russian Service reporter to Geneva when Secretary of State Hillary Clinton had her first meeting with Russian Foreign Minister Sergei Lavrov in Geneva, during which she called for a new start in U.S.-Russian relations. In response to the dismal state of VOA’s Russian Service, some former VOA journalists have launched an independent private website, GovoritAmerika.us, which serves as an aggregator of U.S.-Russia-related news and analyses from multiple American government and non-government sources. GovoritAmerika.us website was available online and included extensive summaries of Voice of America reports when the VOA website suffered a two-day meltdown. With the latest blow of seeing even their current limited work vanish during the critical news window of President Obama’s visit to Russia, VOA journalists are understandably frustrated. Let’s hope that the Obama White House will take notice of this latest example of the BBG’s numerous failures. The latest one is the BBG’s failure to protect America’s lead website for communicating with the rest of the world. Ted Lipien is a former Voice of America acting associate director. He was also a regional BBG media marketing manager responsible for placement of U.S. government-funded radio and TV programs on stations in Russia, Bosnia, Afghanistan, Iraq and other countries in Eurasia. In the 1980’s he was in charge of VOA radio broadcasts to Poland during the communist regime’s crackdown on the Solidarity labor union and oversaw the development of VOA television news programs to Ukraine and Russia. He is also author of “Wojtylaâ€™s Women: How They Shaped the Life of Pope John Paul II and Changed the Catholic Church” (O-Books – June 2008). The book, which describes Pope John Paul II’s views on feminism, also includes evidence of the importance of Western radio broadcasts during his life in communist-ruled Poland and in the first ten years of his papacy. The book also has extensive references to the efforts of the KGB and other communist intelligence services to place spies in the Vatican and to influence reporting by journalists covering the Polish pope. FreeMediaOnline.org is a San Francisco-based nonprofit which supports media freedom worldwide. In December 2008, FreeMediaOnline.org launched a Russian-language web site — GovoritAmerika.us Ð“Ð¾Ð²Ð¾Ñ€Ð¸Ñ‚ÐÐ¼ÐµÑ€Ð¸ÐºÐ°.us — which includes summaries of some of the more serious news and commentaries from multiple U.S. government and nongovernment sources. According to Ted Lipien, the web site is designed to compensate for the loss of information from the United States for Russian-speaking audiences due to program and budget cuts implemented by the Broadcasting Board of Governors. The web site, which includes links to VOA Russian Service news reports, is also designed to counter the BBG marketing strategy that has forced broadcasting entities to focus on entertainment programming and to avoid hard-hitting political reporting that might prevent local rebroadcasting or offend local officials. GovoritAmerika.us web site was developed without any public funding and is managed by volunteers. It is also hosted on LiveJournal.com. BBG officials initially had told the VOA Russian Service that their requests to resume radio broadcasts were a “non-starter” even after Russia invaded Georgia. Only after weeks of protests, including reporting by FreeMediaOnline.org, the BBG finally allowed VOA to produce a short audio program for the Internet, updated only Monday through Friday. This program is rather difficult to find on the VOA website. We made it available for easier access and listening on the GovoritAmerika.us website managed by FreeMediaOnline.org. 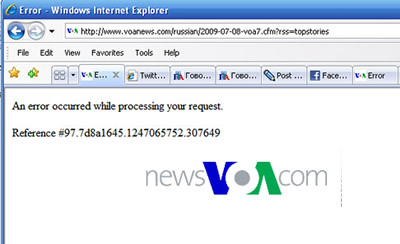 No user commented in " With Obama in Moscow, Voice of America Russian Reporters Saw Their Work Vanish "